1Department of Botany, Chandernagore College, Chandernagore, Hoogly- 712136, West Bengal, INDIA. 2Laboratory of Cell and Molecular Biology, Department of Botany, 35 Ballugunge Circular Road, University of Calcutta, Kolkata- 700019, West Bengal, INDIA. Introduction: Andrographis paniculata is an herb widely cultivated in South and Southeastern Asia. It has been traditionally used to treat infections and other Physiological disorders for several hundreds. We investigated the anti-leukemic potential of Andrographolide (AGP) isolated from the leaves of this plant against an array of cancer cells to investigate its most efficacies in a particular cancer type. Methods: AGP was isolated from Andrographis paniculata leaves by using column chromatography. The structure was further determined by LC-MS, 1H NMR and 13C NMR. AGP was initially tested against four different cancer cell lines, namely NALM-6 (pre B-ALL), K562 (CML), A549 (lung carcinoma) and MCF-7 (breast carcinoma) using MTT assay at different time points and different concentrations. The effect of the isolated biomolecule was also investigated in inducing apoptosis through the study of cell cycle progression using flow cytometry by PI staining and nuclear fragmentation pattern by DAPI staining and fluorescence microscopy. Results: the spectral analysis of the isolated bio-molecule assured that the compound was AGP. MTT assay data indicated that AGP was most potent to induce cytotoxicity in NALM-6 cells. Further investigation revealed that it effectively induced apoptosis by arresting cell cycle progression and increased the nuclear break down in NALM- 6 leukemic cells. 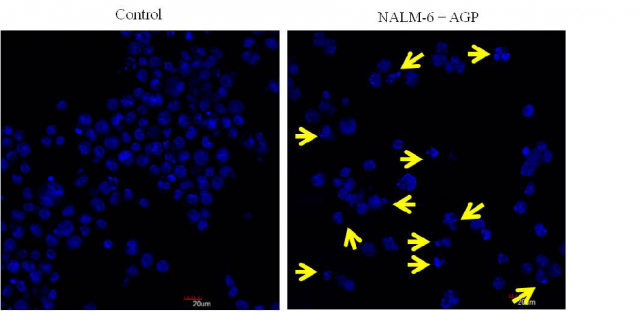 Conclusion: Our study efficiently demonstrated that the AGP isolated from Andrographis paniculata induced apoptosis in NALM-6 cells, which could be used in the therapeutic intervention of leukemia in the future. Detection of nuclear fragmentation in NALM-6 cells after AGP treatment. NALM-6 cells were treated with and without AGP (IC50) for 48h, stained with DAPI and visualized under fluorescence microscope. Sarkar S, Gopal PK, Paul S. Andrographolide Induced Apoptosis in NALM-6 Cells Mediated Through the Cell Cycle Arrest and Nuclear Fragmentation. Pharmacog Journal. 2018;10(2):210-214.